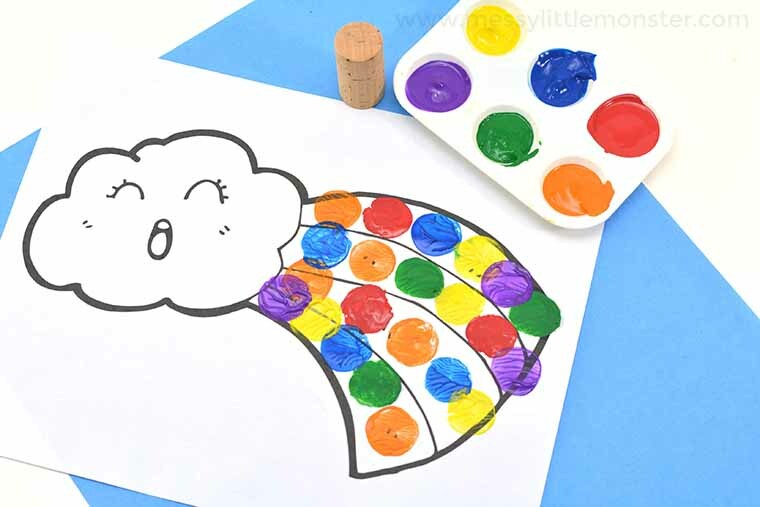 This rainbow craft is such a fun activity for toddlers and preschoolers! 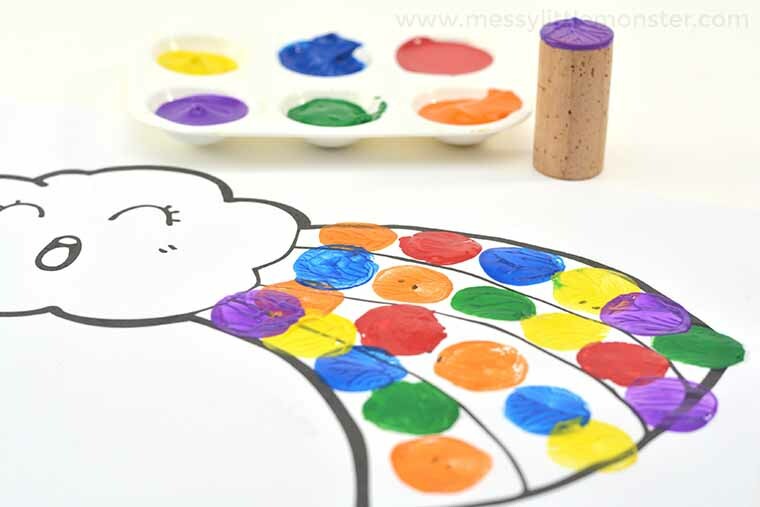 They will love the bright colours used in this rainbow project and cork painting is such a fun painting idea for kids. We've included a free printable rainbow template to make this rainbow cork art project extra easy to set up. Just follow the easy step by step directions below for an afternoon of cork painting fun! Looking for more rainbow craft ideas? Your toddlers and preschoolers will love this no mess rainbow art project or this edible rainbow art toast. We also have a couple of fun rainbow science projects that you might like to try. Toddlers and preschoolers would love setting up and watching the walking water rainbow science experiment or making some colour changing rainbow flowers. Below you'll find easy step by step directions for your own rainbow art! 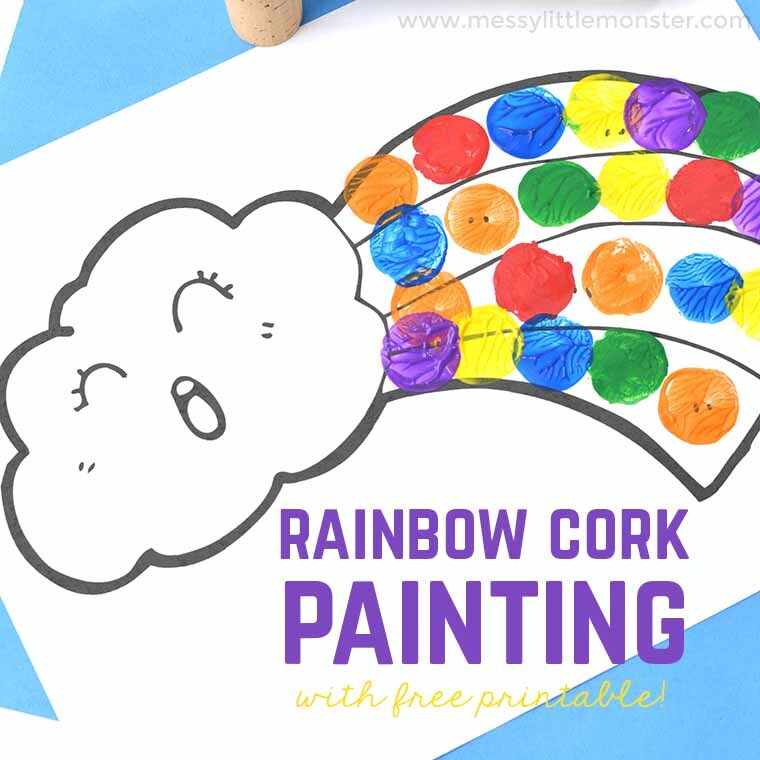 Preschoolers and toddlers will have so much fun learning colours as they get stuck into cork painting with this fun rainbow project. This would be the perfect craft for a playdate or a messy rainbow party! 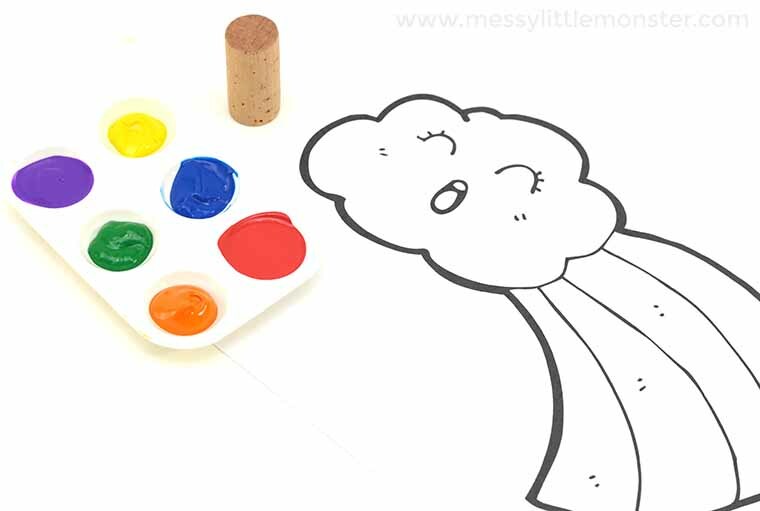 Toddlers and preschoolers will have so much fun with this rainbow activity as there is no right or wrong, they can just have fun adding lots of bright colours to their rainbow. Using a cork to paint with instead of a paintbrush makes it extra fun! Before you get started, be sure to gather up your supplies so you're not running around looking for everything. We all know toddlers and preschoolers only have so much patience! I like to pour my paints into a paint palette or onto a paper plate for easier access. 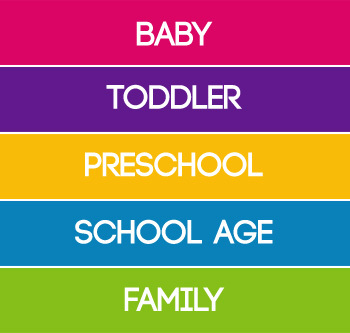 Be sure to download and print your rainbow template. You can find your free download by scrolling down below. Next, it's time to start your rainbow project and let the cork painting begin! 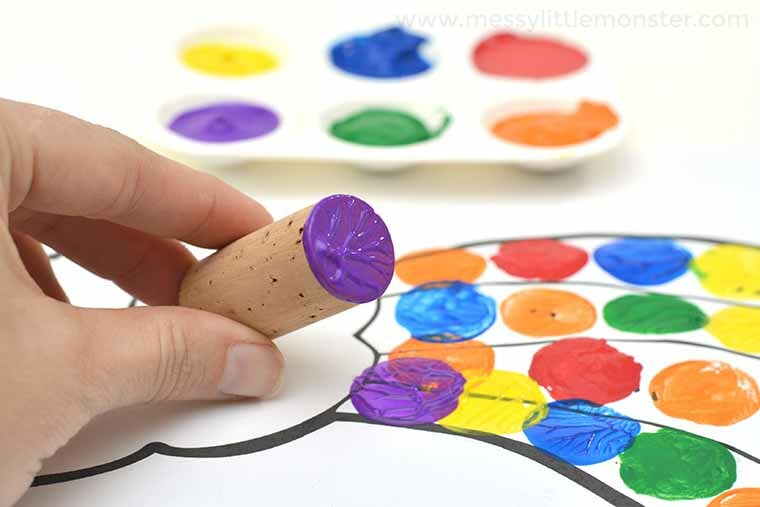 Have your child dip the wine cork into their paint colour of choice and then press it onto the paper. It might take them a few attempts before they have worked out the amount of pressure needed to make a good print. Repeat the previous step for each additional colour. You can either wash off your cork in between each colour, or ideally use several corks - one for each colour. STEP 4: Learn as you paint! This is a great time to engage your toddler or preschooler in a little learning! Talk about the different colours of the rainbow, name all the colours, or even group them together by painting lines of the same colour. 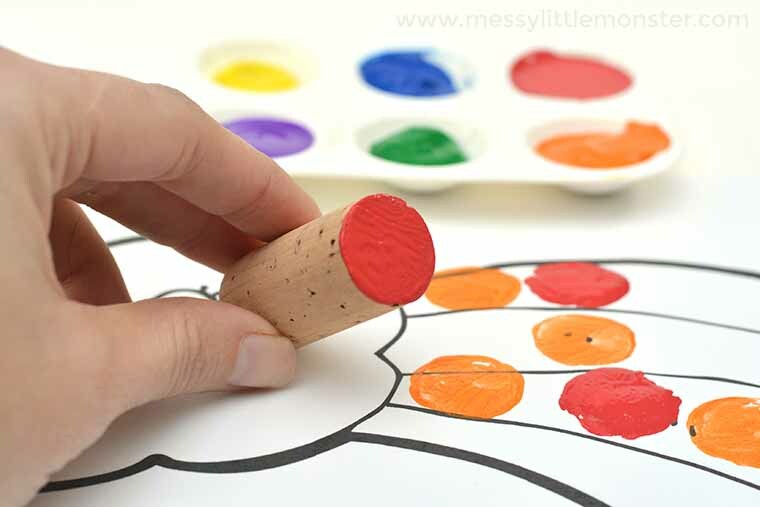 This is a perfect activity for learning colours! To download this printable rainbow template for free add $0 and click on the 'I want this' box below. It may take a moment for the page to load so please be patient. Your toddlers and preschoolers will love this rainbow project! 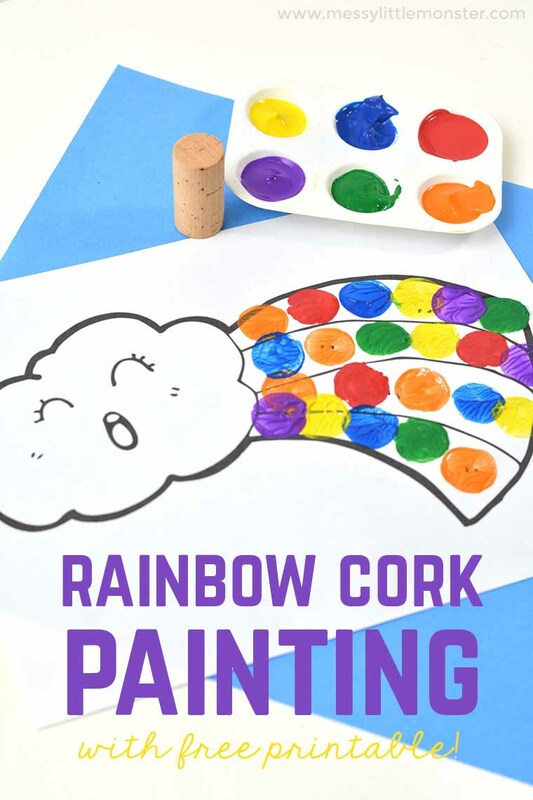 Cork painting is such a fun painting idea for kids and while the kids are painting they can be learning about all the different colours used in their rainbow art! Be sure to check out these rainbow toys and books and this set of rainbow activities for even more fun.